Limited to only 499 pieces, this rare collectible is a variant in Dynamite's line of busts inspired by the artwork of comic book master Art Adams. It reveals a black-and-white alternative take on the cover image of the landmark Red Sonja #50. Sculpted by Jason Smith, this polyresin showpiece boasts cast-metal details and stands approximately 7 1/2-inches tall to the top of the She-Devil's sword hand, with a base measuring 5 1/2-inches x 3-inches. 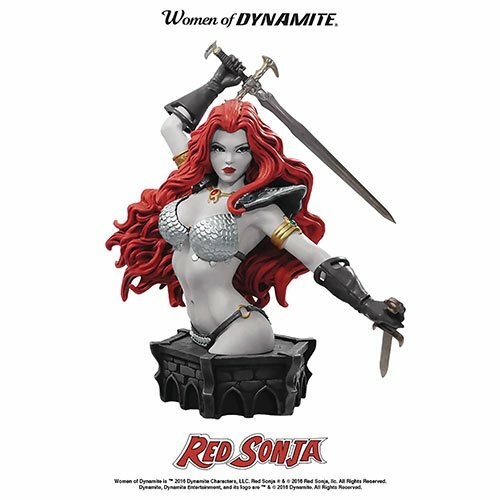 Packaged in a four-color display box, this highly detailed Women of Dynamite Red Sonja Arthur Adams Black and White Bust celebrates one of the industry's finest artists and once of fantasy's most iconic characters! Sometimes, mercenary work is a bloody job… but the She-Devil with a Sword is just the warrior to do it!